When discussing thermal imaging products, one name that constantly pops up in everyone’s head is FLIR. They have a host of excellent products, and they’re constantly at the edge, pushing out new, better products. However, FLIR doesn’t only have thermal imaging products for general use. They also have a few that are made for rifles, such as the FLIR Thermosight RS32 we’re about to discuss. 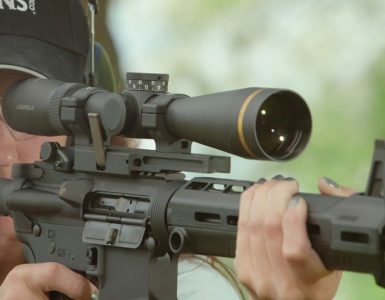 With regular rifle scopes, or red dot sights, you could easily target predators in daylight, or in sub-optimal light conditions. However, the FLIR Thermosight allows you to do the same in pitch black conditions. It is no secret that this kind of product isn’t for everyone. People who generally hunt during the day have little use for such technology. If you’re someone who’s constantly out during the night, this might be an excellent purchase. Without wasting too much time, let’s take a closer look at the FLIR Thermosight RS32, and see if it’s worth your money. How different is it from a regular night vision scope? The short answer is quite a bit. A regular night vision scope will enhance your vision at night. However, depending on the generation, you’ll notice quite a bit of quality loss with cheaper options. To add to that, differentiating predators with a regular night vision scope isn’t always that easy. With a thermal sight, such as the FLIR Thermosight, the scope actually picks up heat signatures using infrared technology. Rather than identifying light, it will display the heat from the animal’s body clearly and accurately, so you know exactly where it is, and what you’re looking at. This is a huge advantage, which somewhat justifies the price. If you were to get the FLIR Thermosight’s level of quality with a regular night vision scope, you’ll need to pay even more. When you’re spending this much money on a thermal scope, you want it to be high quality, and the Thermosight is excellent by all means. The inside shock resistant system (SRS-M) is qualified for an MSR semi-automatic platform, with a caliber of up to .30. This means that the scope was built to last, and it’s built to withstand daily torture of using it on such weapons. 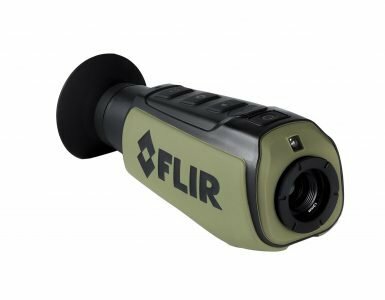 In terms of usage, the FLIR is very simple. It has four buttons, located on the top. You can find them easily regardless of whether you use your right hand or your left. There are two lens caps that protect the optics from dust and debris, and you can easily swing them upwards to get them out of the way. The weather resistance is excellent. Even though many brands claim water and fog proofing, FLIR actually gives us an IP rating – the Thermosight is IPX7 resistant. This means you can easily submerge the scope in up to 1m of water for around 30 minutes. However, we wouldn’t test this claim – there are a lot of electronics inside, and you wouldn’t want to destroy a device that’s this expensive. The FLIR Thermosight comes in a few configurations, the one we have today is the 1.25-5x. At the low range, you’re almost as if you were looking through it with your naked eye. However, there’s also an optical zoom that can get you closer to your target. Night time hunting is often done at close ranges, so 5x zoom should be close enough. The scope has a focal length of 19mm, and the horizontal field of view is 16 degrees. Even though it has a fixed focus, the FLIR Thermosight gives you +/-6 units of diopter adjustment. With 3” of eye relief, this should be quite a bit, even for people who wear glasses. The display, even though a touch small, has a resolution of 640×480, and it displays at 60 Hz. If you find this small, there’s a video output you can use to watch things on a larger monitor, even though we find it hard to do this while hunting. You will find a couple of color palettes with the FLIR Thermosight. There are the standard ones, black, white, sepia, iron and red, and there’s the FLIR InstAlert option that has a black and white background, but highlights heat-emitting objects in red. There’s also the choice of three reticles in four colors – Duplex, Fine Duplex and German, that come in White, Black, Red and Green. When you consider everything, there’s quite a bit of customization available with the Thermosight, so you can set it up just as you like it. If you ever get good performance out of a thermal imaging scope, it’s going to be from a FLIR, and the RS32 doesn’t disappoint. The image is clear and crisp, and animals can be spotted immediately with no issue whatsoever. The scope can be mounted on a MIL-STD-1913 Picatinny Rail, which guarantees compatibility with a host of weapons. Battery life is decent, with the promise of over 4 hours being delivered on. You can charge it with a USB cable, and it also accepts an external power pack. 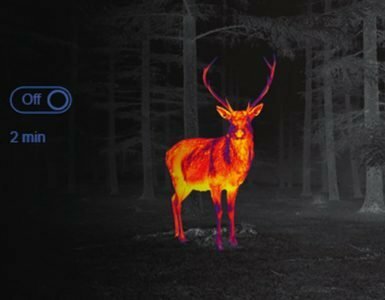 Final verdict – is the FLIR Thermosight RS32 worth the asking price? When you first see the price, you’ll immediately think it’s overpriced. However, think about what you’re getting. 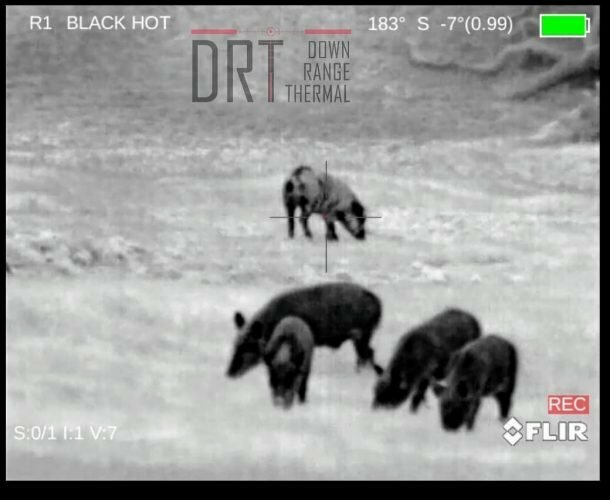 FLIR is a very reputable brand, and the Thermosight is one of their best thermal scopes for hunting. The night time performance is absolutely incredible, the scope is accurate and you have quite a few customizability options. It’s built really well and it’s made to withstand the elements, so it’s definitely a long-term investment. If you’re hunting often during the night, you will want a reliable scope. One that will work no matter the conditions, and one that won’t compromise when you can’t afford it. The FLIR THermosight RS32 more than fits the bill.